Dew Research has released an updated version of their numerical solution components for Delphi XE7 Firemonkey. In the past this library has supported Windows but apparently it now unofficially compiles to Android and OSX as well*. You’ll have to verify that with the Dew Research team if you’re interested in those platforms. This is actually a studio of components called Dew Lab Studio that are broken down into different packages. There is the MtxVec package which is the mathematics library with LAPACK support. There is the DSP Master package which is the advanced signal processing package for MtxVec. There is the Stats Master package which has basic and advanced routines for statistical analysis. And finally there is the Data Miner package which is a group of components for enabling artificial intelligence and incremental learning in your applications. This is really a complex set of components which a massive amount of functionality. If you’re interested in any of the different packages you’ll really need to check out their site for more in depth information on each individual package and how it can speed up your application development. Apparently the Dew Lab Studio which includes all the mentioned packages also includes the latest version of TeeChart. There are trial versions available of these commercial components and some installable demo apps to check out. I would think if it unofficially supports OSX and Android it may also be usable from Appmethod. 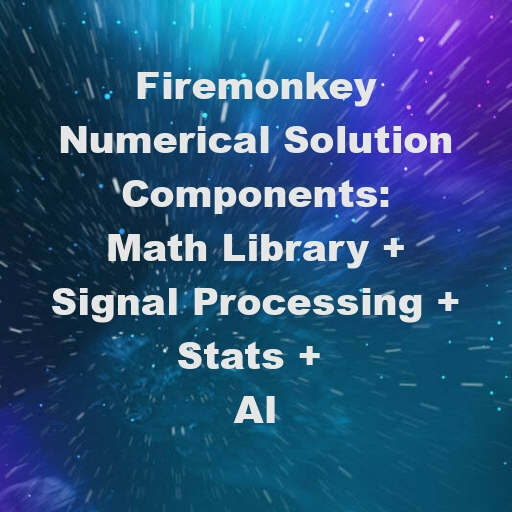 Head over and check out all of the features of this complex numerical solution for Delphi XE7 Firemonkey before downloading the free trial.